Going TT on that 3L? I have always had in my mind to build a 6G72TT AWD 7G. So I tried out the 4x4, it sure does crawl, din't finally see outside of windows. The car has been sitting all year. Now has new license plate from one of my old cars. I hope to get the 4x4 and 6G74 swap done in the next year. That is going to be an interesting swap, nice to see your still messing with the 7g! I'll be messing with this 7g all my life. I have had it now for 7 years. I went to high school, university and work with it. A lot of parts are replaced for now. The time has come to evolve more. 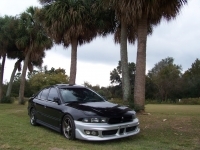 This is my Galant Evolution I'll mostly use mitsubishi's OEM parts from different models to put it together. From now on, it has parts from the USDM 7g(interior, fully electric leather seats are from 8g) One of my good friends has now the only USDM 7G in our country. Front knuckles with 2 piston front brakes are from facelift european 8g, since they come with 160mm brake bracket. 5 lug wheel hubs are from 2g DSM. It was all done so that the EVO brembo swap would be bolt on. Rear axle comes from 6G73 2.5V6 4x4 7g (E88). These things also come with 4 Wheel Steering, the same system like 3000GT-s. They also have ventilated rear brake discs, just like 3000GT. Electronically Controlled Suspension is in the standard with these E88-s, and the same is with 3000GT. Originally I planned 3000gt engine for my car. I want to put together a car that Mitsubishi should have done,something I would call a Grand Turismo 4door, or a 5door in my case. A pajero 3.5l V6 is a nice challenge which requires a lot of modifications to make it work with differrent engine layout. I'm pretty sure that i will bolt on the full twinturbo setup from my JDM Mitsubishi GTO. I will buy a newer engine for it. A Mitsubishi Debonair's 6G74 would be bolt on, but we didn't get these cars. Yes, back in the day I knew someone back home with a similar 7G, 6g73 AWD, that car is begging for the 6g72tt :D You should join up the fb group, "Galant Owners USA"
i can't even found a decent 7g to toy with. Buy this thing already, tired of looking at it on CL, FB and wherever I run into it in town lol. Other than that, I rarely see any for sale. I can buy a decent 9G V6 for that asking price. But then it won't have a 4g63..